This might seem like a pretty obvious question. You just tie them in a knot right? Wrong! Actually, tying your lace up loafers so that they stay perfectly in place might not be quite as straightforward as you first envisioned. For a start, chances are that the laces will be made of a matching or contrasting leather, rather than fabric, which makes them that little bit harder to secure. It’s also worth pointing out that when we’re talking about how to tie loafers, what we are specifically talking about is a Moccasin style shoe. A Penny Loafer, for example, has no laces at all, although it might have some decorative hardware detailing. All in all, really the question should be: how to tie your Moccasins. Unless you trained in the merchant navy or you did a course in knot-tying at one of your after-school clubs or summer camps, chances are while you might know the names of various common knots, you will have no idea how to tie them successfully. So we are going to walk you through some of the most common knots and how to use them to effectively and securely tie your Loafers. This is a handy knot to learn how to tie, as it’s practical for all kinds of scenarios and perfect for your stiffer Loafer laces. You start by crossing the left lace over the right and wrapping them around each other to create your first starting knot which is the basic foundation for this style. Next, you need to create what looks like two little bunny ears with your laces by forming loops on both sides: the left and right. Hold the two loops side by side for a quick moment to check that they match up and are roughly of equal size. You don’t want lopsided bunny ears now, do you? In the next stage, you are going to fold the left loop over and around your equally sized right loop. Next, with gentle pressure, pull it through the hole that forms between the two loops but don’t go ahead and tighten the laces up just yet. Next, you are going to fold the right loop over the back so that it actually crosses under the left loop, and feed it back through the same middle hole that you just fed your left loop through. Do another quick visual check to ensure that your loops are still equally proportioned. Now you can go right ahead and tighten up those laces so that they form an elegant and secure, evenly structured and tidy looking bow. Even if your Moccasin has slippery waxed leather laces, if you tie them this way, they shouldn’t come undone, and it’s a style that really looks very neat and tidy. 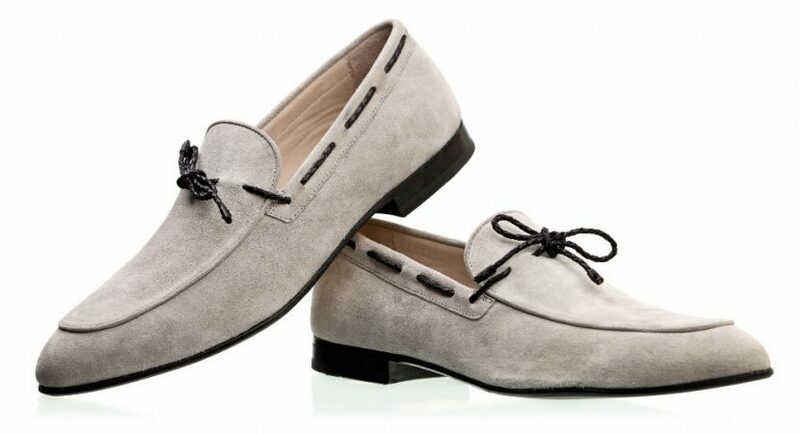 It looks especially nice on leather or canvas Loafers. This is another style of knot that is worth learning how to perfect, as it works really well with leather Moccasins shoelaces. It’s a very decorative looking lace, so it might not be to everyone’s personal style and taste, but it is very effective at keeping laces neatly in place and preventing them from getting in your way and unravelling when you are walking. In this technique, you don’t start with the usual starting knot. The two ends are dealt with independently and never secured together, so you exactly replicate the method of tying a boat shoe knot on both sides. Start by forming a loop with your right lace using about one-third of the lace itself and leave the rest of the lace to dangle at the side. With this technique, you won’t be able to use the laces to tighten and secure your shoes in place, so make sure that they fit well and can be worn as a slip-on without needing to be tightened in the traditional sense using a shoelace. Next, you need to wrap the end of the lace around the loop you created and start to form a tight coil around the loop in any direction. Make sure that the spiral is really tight and neat so that it looks stylish. Just continue to wrap and coil the lace in this way until you reach the top of the lace and only have a small tail left. Then you just need to feed the short end through the top of your loop and give it a good tug to tightly secure in place. Use precisely the same technique on your other lace so that you have two wholly symmetrical and coiled boat shoe knots. Like we said earlier, this knot is more about style rather than practicality. It’s a decorative knot rather than a functional one, but it adds a lot of character and personality to the overall look of your Loafer. Finally, let’s take a look at how you tie a standard shoe knot. If you just prefer to keep it old school and classic, then there is nothing better than a standard knot for securely holding your laces in place and giving your Moccasins an elegant and refined finish. As with the first Seaman’s knot we discussed, your starting position for this technique is to create that basic starting knot. This is, in fact, the starting point for many different types of knots. So master this, and you have a good foundational knowledge. Starting with either the left or right lace, depending on which you feel more comfortable handling, form a loop then wrap the lace around the back to create a second loop. When you have two loops, slightly pull them together to tighten and secure in place. This is the standard knot used to tie almost all shoelaces so you will no doubt have learned this method as a child. It’s not as secure as the double slip knot, but it’s easy to execute without you needing to refer to a knot guide for assistance! Just be aware that you might find yourself bending down more frequently to re-tie those pesky unravelling laces! So there you have it. Three almost foolproof techniques that should help you tie your Loafers in a neat, stylish, and secure way.